In addition to Council Officers talking to local people about the long term plan for the borough, on the other side of the road I was very pleased to see the 'Leave the EU' campaign talking about the long term plan for the country! 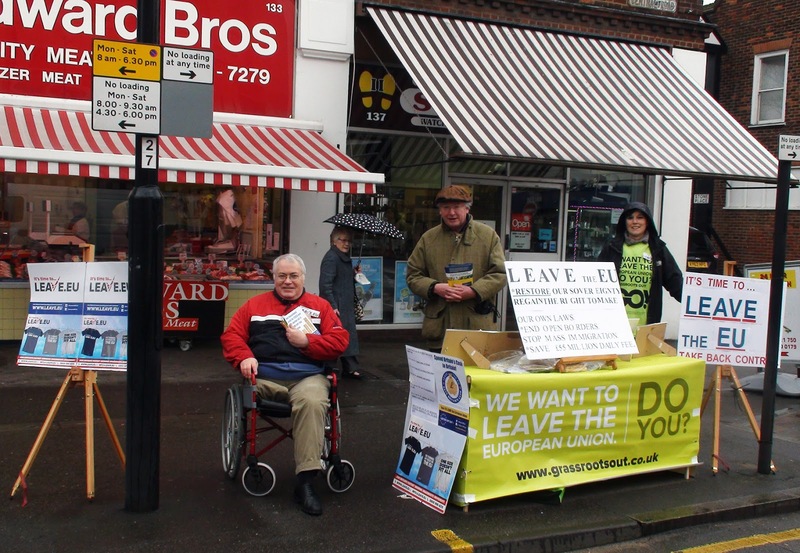 They were certainly firing on all cylinders, handing out leaflets and engaging people in the debates about the up coming vote on Britain staying in the EU or not. There were at least ten active volunteers (update: I've now been told there were 17 at one point) about the hight street handing out leaflets giving a multitude of reasons why we should leave the EU. Pictured above are Bill Main-Ian and Angus Dalgleish who stood for UKIP in the two Sutton Constituencies (Carshalton & Wallington and Sutton & Cheam respectively) in last year's General Election (in which Paul Scully won Sutton and Cheam from the Lib Dems). Melissa Campbell, the local organiser is also pictured. The campaign is very keen to point out that this is a cross party or even non-political campaign and that there are plenty of Labour, Conservative and even some Lib Dems signed up to help as well as UKIP members and others. I should point out at this juncture that I am in full agreement with them. For more detail on my views and reasoning about this issue, please see my personal (non-Worcester Park) blog here. I even helped them hand out leaflets for a few minutes. Having known Bill for a few years it was nice to be campaigning on the same side as him, even if it was for a short time!